Ireland has always had something of an affinity with the United States. Decades of mass emigration to the States created a powerful Irish-American community, so influential that presidential candidates are always keen to highlight whatever tenuous link they have with this tiny island. The visit to Belfast by Barack Obama before the G8 Summit was, like all other presidential visits, a circus of sycophancy and flattery, revealing much about our media and political class. Politicians, dignitaries and journalists appeared infatuated as the charismatic, photogenic war criminal took to the stage at the Waterfront Hall to instruct us how to build a peaceful society. The crowd giggled and cheered when he used a common local phrase, handing an easy “news” angle to an obedient local media. The pomp was absurd and the conduct of our politicians, who are supposed to constitute a government, was embarrassing. United Left Alliance TD Clare Daly put it well when she attacked Enda Kenny for “prostituting” the country to the Obamas “in return for a pat on the head”, for which the Taoiseach attempted to rebuke her in his characteristically dull and mumbling way. As ever, the local media in the north was devoid of any real analysis. Irritating clichés such as “feel good factor” and “putting Belfast on the map” were brandished about by hacks who had clearly run out of things to say after violence predictably failed to materialise at the ICTU’s anti-G8 demonstration last Saturday. Obama’s apparent support for the northern peace process was hailed by many. No mention was made of the ongoing occupation of Afghanistan or the thousands of civilians murdered by CIA drones. Nor was the incarceration of Bradley Manning, who has spent over three years in solitary confinement, deemed worth discussing. The Obama visit exposed the insular, provincial mindset which is dominant in the north of Ireland. Despite the mutilated corpses of nearly 200 children murdered by US drones in recent years, the president was treated like a demigod, whose infinite wisdom on peace and harmony was to be bestowed upon us mere ignorant Paddies. This was in keeping with our political leaders’ peculiar fixation on seeking approval from the most violent and aggressive government on earth for the Irish peace process. SDLP MLA Conall McDevitt described Obama’s speech in the Waterfront as “inspirational”. No acknowledgement was made of the countless crimes committed by Obama’s administration. The SDLP appear to oppose political violence only when it happens on a small scale here in Ireland. This is part of an alarming tendency which has taken hold in the west. George W Bush was rightly despised by most people around the world, unlike Barack Obama. He still enjoys a considerable degree of popularity. Yet, in many respects, Obama is worse than Bush. Not only has he continued Bush’s wars, he has escalated them with enthusiasm. At the minute, he is seeking to arm gangs of Islamic fundamentalists in Syria, a prospect which promises to make the bloodbath there infinitely worse. His administration has persecuted more whistleblowers than all other previous administrations combined, most recently, Edward Snowden. And, in a disturbingly Orwellian fashion, Obama sits down every Tuesday with a team of national security advisors to draw up a list of people, no matter where they are in the world, to be summarily executed by US forces. Did he take time out of the G8 Summit last Tuesday to draw up a similar list? Did he ponder about who would be on his list this week after speaking with school children in Belfast? Questions such as these are deemed unmentionable by our obedient media. Obama’s charm has deceived many. It’s no accident that he was awarded ‘marketer of the year’ in 2008 by Advertising Age. As well as being a war criminal, Obama is also a brand. His supporters don’t want to accept that he has continued Bush’s wars, filled his administration with Wall Street lobbyists and spies on American and foreign citizens. All of this is brushed aside by his liberal apologists who suggest he is unable to do anything different. The fact that he is less blatant about his imperial crimes than Bush was appears to have absolved him in the eyes of trendy middle class liberals. Where is the popular indignation against Obama that we saw when his predecessor invaded sovereign nations? Where is the outcry about the plight of hunger strikers in the Guantanamo Bay internment camp? Why do we not hear calls for his arrest for war crimes, as we did with Bush? It’s of little shock that the gombeens and arse-lickers who packed out the Waterfront Hall – similar to the ones referred to by Christy Moore – fail to see beyond Obama’s sinister propaganda. On August 9, an article in the Belfast Telegraph warned readers that Northern Ireland faced an impending economic “meltdown”. Accountancy firm KPMG’s Eamonn Donaghy, described in the report as “a top financial expert”, argued that the region’s economy was not sustainable without reducing corporation tax to 12.5%, in line with the Republic of Ireland. Mr Donaghy is one of a long list of “experts” regularly carted out by the local media in support of the tax cut. Unimaginatively held up as the saving grace of a battered economy, all four main parties in the Stormont Assembly have rallied behind the appeals of these “experts”, whose collective failure to foresee the worst economic crisis in 70 years should, by all rights, consign them into obscurity. The prevalent narrative of the issue is a pleasingly simple one – low taxes will attract business to the region, and this investment will create jobs. Reporting of the issue has been extraordinarily one-sided. Representatives of banks, finance firms and other multinationals are given considerable space in the Irish News, the Newsletter and, of course, the Belfast Telegraph. In the article mentioned above, Mr Donaghy was treated as a well-informed, unbiased commentator. Nothing was said of the fact that his firm, KPMG, would stand to gain a great deal from the tax break. “In every other country where corporation tax rates have been significantly cut,” Mr Donaghy said, “positive economic benefits and job creation has happened.” The names of these countries were not mentioned and no evidence was provided to back this up. Pot of Gold or Fool’s Gold?, a thorough report carried out by Tax Research UK’s Richard Murphy, demolished the case for cutting corporation tax. Promises of job creation were shown to be a hopeful gamble with a large immediate cost. 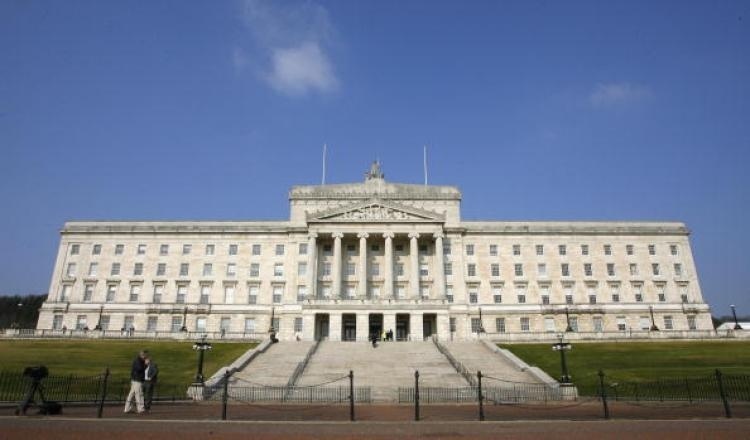 As a result of a previous EU court ruling, a minimum of £300 million will have to be cut from Stormont’s block grant from Westminster if the tax rate is reduced. On top of that, not a single new job can even be guaranteed. Murphy’s findings were given little attention by the local press. Parties from both the unionist and nationalist sides, notorious for inter-communal bickering, have been remarkably united on this particular issue. The conventional wisdom states that north is “over-reliant” on a “bloated” public sector, which requires a “rebalancing” of the economy. However, the private sector-led recovery promised by David Cameron has not happened in Britain, and there is little reason to believe it will occur anywhere else anytime soon. It marks a curious juncture in Irish politics when nominally centre-left parties, Sinn Féin and the SDLP, adopt a distinctly Thatcherite economic platform. Advocates of this corporate welfare have, on occasion, been surprisingly candid. When he addressed the Northern Ireland Affairs committee in 2011, CBI NI chair Terence Brannigan admitted: “There is no guarantee [of job creation] and it would be totally misleading of me to sit here and say that I could guarantee you. I couldn’t guarantee you anything.” Former unionist MP – and millionaire – John Taylor, now Lord Kilclooney, told the House of Lords that “95% of the population of Northern Ireland who are not company directors would be worse off”. Suggestions by proponents of the tax cut that the Celtic Tiger was fuelled by the 12.5% rate, too, are groundless. It was, at best, a secondary factor in causing the boom in the south of Ireland. The Irish state had an overall lower tax base with many loopholes which could be exploited by big business – something the North could never duplicate while it remains under the jurisdiction of the UK. More important to foreign investors than a low corporation tax during the boom years was Ireland’s highly educated, English-speaking workforce, its proximity to mainland Europe and its lack of government regulation (along with widespread corruption carried out in the interests of capital). The refusal of multinationals to pay their fair share should be challenged, not accommodated. A race to the bottom serves only the interests of the super-wealthy. Reducing what is already one of the lowest corporation tax rates in Europe is not going to stem the effects of the Great Recession, no matter what business “experts” contend. Tax cuts don’t develop economies or create employment – they create tax havens. Neo-liberal solutions will not solve a neo-liberal problem.